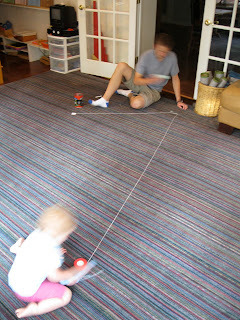 It's easy to create shapes on the floor with tape. Duct tape leaves a lot of gummy residue, so I prefer vinyl tape. Shapes such as the ellipse are ideal for gross motor activities (e.g. marching to music) or for group time "on the line" at the beginning, middle, and/or end of the school day. 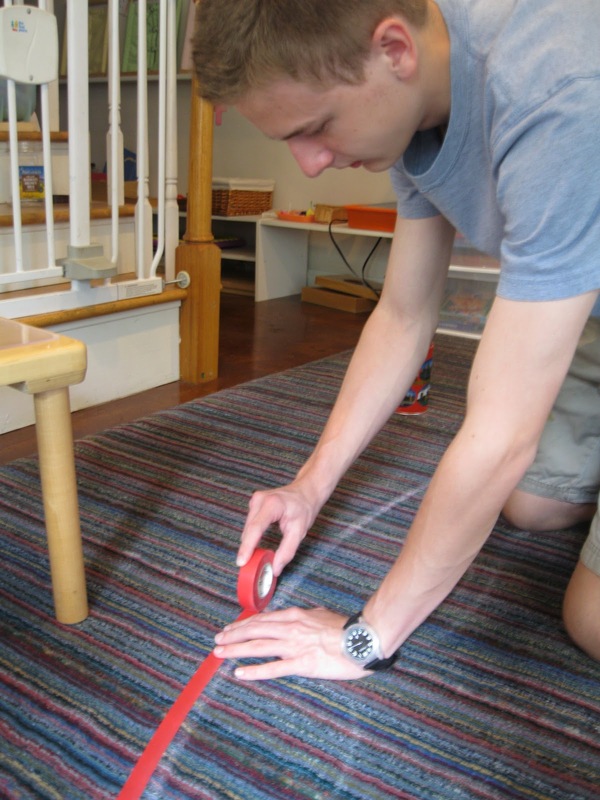 Many classrooms--in school settings or at home--have large shapes on the floor. The ellipse is a traditional Montessori shape. One day you might see children walking along the ellipse heel-to-toe, with or without music. Another day you might see a child walking along the line with a glass full of water, practicing balance and control. On another day you might see a child walking on the ellipse while holding a bell, trying not to let it make a sound. These kinds of activities are great for children 2 1/2 and up, when the child is perfecting his balance and control of movement. Duct tape, chalk, vinyl tape, and string are all you need. Start by taping two ends of string down to the floor -- each of these two spots is called a "focus" of the ellipse. Make sure that the length of the string is a good deal longer than the distance between the two foci. Then use a piece of chalk to stretch the string taut, and, keeping the string stretched, use the chalk to trace out a shape - this will give you your ellipse! This is easier to see than to describe in words: here is Tesla in action. Tesla substituted standard chalk with sidewalk chalk because it marked the carpet better. Figuring out where to put the two foci at the beginning requires a bit of trial and error. We started by determining how big we wanted the finished shape to be, and then played around with the string to figure out where the two foci of the ellipse should be. Here, Tesla has guessed where the first foci should be by taping one end of the string down. Once he was done marking out the ellipse in chalk, Tesla uses the vinyl tape to go around the chalk. We tried to put the tape directly over the chalk, but it just wasn't adhering well enough. Ta da! Ready for movement, learning and play! This looks like a great project for this week! Maybe we will make one in our garden with stones or on the driveway with chalk instead. Thanks for sharing this information, i will try to do this in the kids room, there is plenty of space there so i don't think it will be difficult to make an ellipse on the floor. Want to help A with learning to stay in the circle. Did you have to order online or can I find it locally? Thank you so much! I just made my first elipse, perfect on first trial! We are having a Celebration of Life birthday party in an hour: the children will love it!